I had to mess with the photo editor settings so you could see the relief work for the S shield. Things have changed since last we visited with Superman in the regular comics. Perry is getting chemo for his cancer, so Clark is acting Editor until he gets better. Superman’s lost his powers due to events in the crossover The Final Night. And he and Lois had an argument and separated. But when they meet up again they’re back together and the wedding is on! This time it’s not a hoax, imaginary tale, or set in a parallel universe. This is the issue where they get married. And for once no supervillains ruin the wedding (although some jerks mess up Clark’s bachelor party). Lois goes apartment hunting and finds a great one…but it’s on a waiting list. Luckily Bruce Wayne owns it and Batman gathers some heroes to watch Metropolis during the honeymoon. (Of course Superman isn’t letting a little thing like no powers stop him from stopping bad guys.) 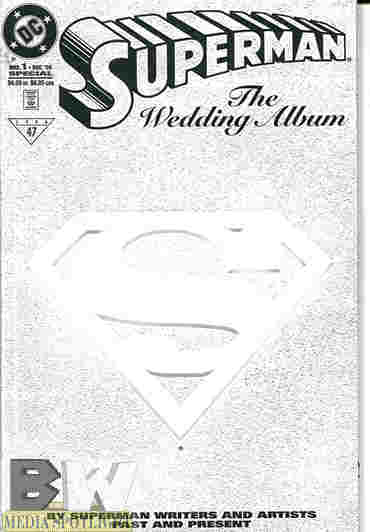 A lot more happens but the important thing is that Jerry Siegel is performing the wedding with Joe Shuster and as many classic Superman creators as they could fit sitting in the pews. This comic is just full of little details that makes it really good. Watching the bridal shower and other parties leading up, Sam Lane’s issues with Clark, even Mxyzptlk just pops up to be a jerk and doesn’t disturb anything. There are a lot more but it’s all about these two characters that people grew up with getting ready for their wedding. They sneak in a few crimefighting bits, but that’s otherwise all there is. It’s just a joy to read. It’s not perfect. While some fan will find a character he or she recognizes and certain subplots are either advanced or resolved in the characters’ personal lives, there were a number of characters I didn’t recognize and just didn’t care about. I understand all the previous artists wanting to be part of this (the ones alive and still drawing anyway) but it makes the art rather uneven, and some artists are clearly better than others while some just aren’t that good or just makes it look silly during their pages. Imagine if they had done the same thing with all the living and working writers from comics past. However it’s still a really good marriage comic that avoids the usual superhero wedding tropes and just focuses where it should, on the love of two people named Clark Kent and Lois Lane as they prepare to become husband and wife. I do recommend giving this comic a look. Posted by ShadowWing Tronix on March 26, 2018 in DC Spotlight, Yesterday's Comics and tagged Clark Kent, DC Comics, DC Universe, Lois Lane, Super-Marriage, Superman.